Take your pet dog's Star Trek fandom to the next level with the Star Trek The Original Series Uhura Uniform Dog Shirt. After all, your beloved pet's gaze is as fixed on the tube as yours is watching those addicting reruns! This fantastic red shirt features the Engineering insignia and the same stripes you'd find Nichelle Nichols wearing on the sleeve of her uniform in the TV series. Not only that, but the piece even includes an attached skirt toward the bottom, too! 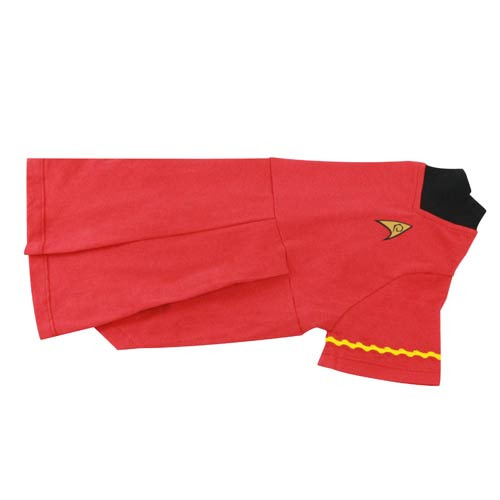 The Star Trek The Original Series Uhura Uniform Dog Shirt is made from a cotton jersey fabric with rib rim and includes metallic embroidery on the insignia and braid.